I’ve been using QuickBooks for my businesses for about a decade now (and Quicken, for personal finances, since Microsoft Money closed-up shop in 2009). It is single-handedly the ugliest, worst designed and most unintuitive piece of software that I’ve ever used, but it works. It does what it needs to do. So I simply: take notes on where I need to re-locate those elusive little features that intuitively should be located in different places, squint my eyes and try to ignore the antiquated icons, the poorly conceived aesthetic and grid, and the painfully amateur process flow and organization of the product. QuickBooks had been bad since before Money went south, and still it found a way to best Microsoft. Now, with no real competition in the well-designed corporate financial applications sector (other than Intacct Winter, Sage 50 Pro Accounting, FreshBooks, Mint, Quosal, Concur Expense, Xactly Incent Express, etc. ), Intuit can keep on unabashedly releasing terrible software. But I digress. I’ve been using QuickBooks 2009 through last month, when I received a notification that they would no longer be supporting the QuickBooks Email feature for older versions. It’s a free feature that allows me to easily and quickly provide digital copies of invoices and statements to clients. In fact, it was the only intuitive process they had in the whole application: You simply log-in to QuickBooks, browse to the invoice or statement and click “Send” and it’ll prepopulate an email to the client, print a PDF of the document, attach and send. The notification detailed that they wanted to focus on providing this feature to more current customers/versions and that I needed to upgrade in order to use the service. After receiving the notification, I debated with my accountant the point of upgrading to QuickBooks 2012. I’d already memorized the quixotic process flow and figured out their capricious organization. If the only issue I was having with the software was the QuickBooks Email feature, why upgrade? A new copy of 2012 is only $200-400, he said, and it’s always good to have a current version of the software. (I, who am perpetually annoyed at Apple foisting upgrades to their bazillion little helper apps, am inclined to disagree). But I relented and spent $185.00 on the upgrade. After installing and upgrading my corporate files, I finally got around to sending a client an overdue invoice. I click the “Send” button and I see the following message: “QuickBooks Email is only available to customers who have monthly subscriptions to the following online Intuit applications…” And despite being conned into spending almost $200 on a new version of QuickBooks, subscribing to a monthly payroll service provided by Intuit (which isn’t one of those required online Intuit applications) and being able to have the QuickBooks Email service for free for the past decade of loyal patronage, I still couldn’t use this feature. While this feature used to be free, it is no longer free and would only be provided to customers with monthly subscriptions now (read: their highest paying customers). I hung up the phone in a rage. Naturally, the representatives didn’t bother to ask me to complete a survey. Intuit is simply following in the footsteps of Geni.com, Spotify, and all those other greedy corporations out there that have decided that gradually stripping away features to squeeze more money out of customers is a strong business ethic. It isn’t the first time they’ve done it, either. 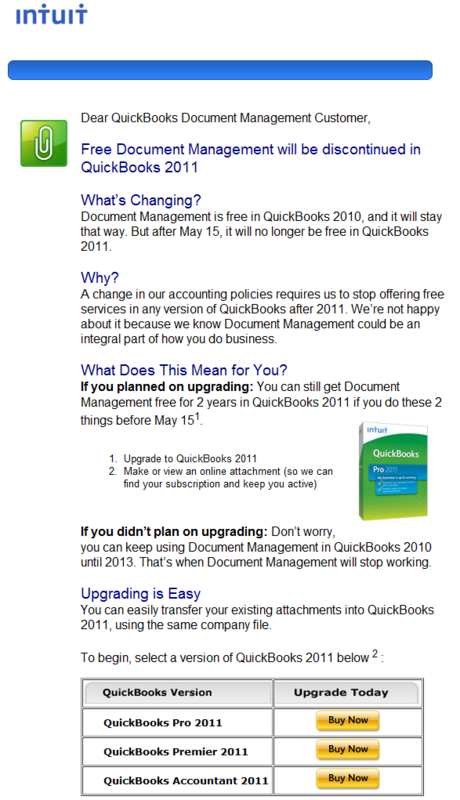 On May 15, 2011, Intuit sent a note to their customers informing them that QuickBooks Document Management will no longer be included in QuickBooks, starting with version 2011 (click the image for details). Why? If these are the ethics that QuickBooks uses in treating their loyal paying customers, I am beginning to wonder about my own ethical policies. Why should I continue to give money to a corporation that is seemingly turning this practice into a business model? In the meantime, I’ve found a work-around for the QuickBooks Email issue where I can send invoices using an external SMTP server. This feature wasn’t available in QuickBooks 2009 because it wasn’t needed when the email feature was free. Again, it’s in a hidden, convoluted location in the software. If you find yourself in the same predicament and need assistance setting up the QuickBooks Webmail feature for Invoices and Statements, drop me a line. Or leave a comment if you’re irritated by Intuit’s practice or have an equally frustrating story to share.